Dragon Age: Inquisition has a terrific cast. There are dwarves, elves, mages, and towering Qunari, all of whom are interesting people with diverse backgrounds. Awesomely enough, the game also includes one of mainstream video gaming's best trans characters. 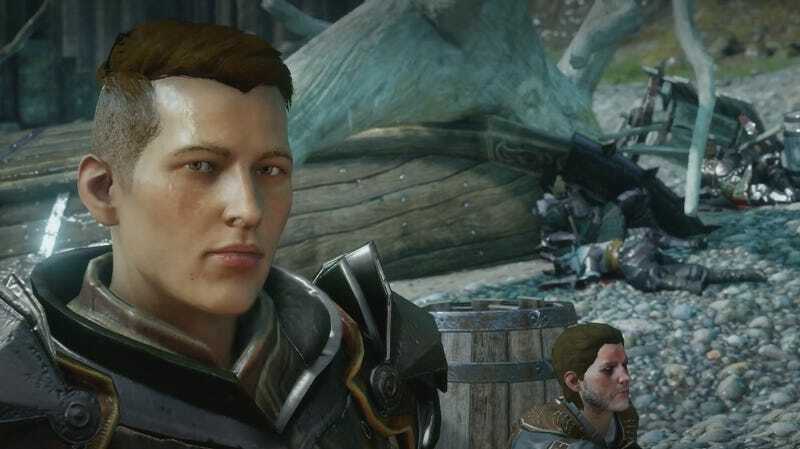 Krem has been lauded around the Internet; The Mary Sue goes so far as to posit that Krem may be "the awesomest representation of a trans character in a mainstream game." Krem is voiced by veteran voice actor Jennifer Hale (who played the lady Commander Shepard in Mass Effect, among many other roles) and while BioWare has drawn some criticism for casting a cis woman to play Krem instead of a trans man, others see casting a heavyweight like Hale as a minor character like Krem as a sign that BioWare was committed to getting the character right. In a cool new post on the BioWare blog, EA/BioWare writer Patrick Weekes has shared some of the process behind coming up with Krem. It's a neat read, and demonstrates just how seriously the game's creators took issues of representation and how carefully they approached the character. On the writing side, I wrote Krem as best I could, and the editing team looked at every line and cleaned up dialogue and paraphrases that could give the wrong impression. I then passed him to two friends in the GQ [genderqueer] community… at which point they showed me where I was absolutely messing things up and gave me constructive feedback on how to improve. In the first draft, Bull was the one who brought up Krem's binding as a friendly joke. My friends pointed out how incredibly hurtful such a callout was for many trans people in real life ("Hey, by the way, you're actually a woman, just wanted to remind you!") and that it made Bull into an incredibly offensive jerk. This was not at all what I wanted—people playing now will note that Bull and Krem give each other grief about little things all the time, but never attack truly sore spots—and I rewrote the scene so that Krem is the one who brings it up first. This makes it clear that Krem is comfortable discussing being trans, and the player will not be offending Krem by asking questions about it. In the investigate hub where you can ask Krem about his past in Tevinter, the first draft had him deserting after fighting off someone who discovered his secret and tried to assault him. My friends noted that this played directly into the sad "attacked trans person" cliché, and while it was plausible, it was an ugly event that could well trigger trans people who have experienced harassment in real life. The goal was for Krem to be a positive character who was living his life happily now, and I revised his departure from Tevinter accordingly. That realization—that the best way for non-trans writers to keep from screwing up trans/genderqueer characters is to ask trans and genderqueer people for feedback—is so crucial. It's awesome to see someone be so clear and transparent about that process, and the learning experience that followed. It also suggests that even if BioWare didn't get everything perfectly right this time, they're still actively listening and learning, and will likely continue to move toward better inclusivity and representation in their games. Here's hoping that more studios can follow their example.